Youth today are the agents of change and I am fortunate and excited to belong to same enthusiastic age group! Life is a precious gift, so everyone can and should contribute their part to make this world a better place to live in, in every way that one can. This is our world and our people so lets join hands and work for a better tomorrow. That’s my vision and I want to be part of facilitating this transformation. And that is what led me to apply for, pursue and become the International Climate Champion 2010, as part of a British Council Programme. First of all, I would like to thank the entire Delhi Greens team and specially Govind Sir for his continuous support and guidance. 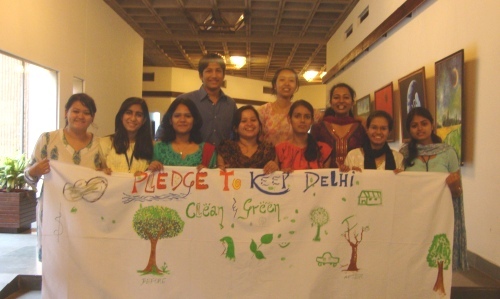 My association with Delhi Greens was my first countable step towards environment which brought me closer to environment and helped me understand its intricacies in a better way. Working as a writer with the organization and reporting on various aspects of environment was quite a close call, experiencing the ignored environment and its implications on people. To share more about my role as the International Climate Champion, my project is about spreading awareness in Government aided schools through plays, nature walks, films, games and workshops conducted to bridge the gap between school students and Mother Nature. The second phase includes installation of paper recycling plants in these schools which will be operated by students themselves, under the supervision of their teachers. The outcome of the project on paper recycling and its ultimate success will be in saving large number of trees and reducing the carbon footprint at the school level. The participating students will indeed emerge as better and more aware citizens of tomorrow. “Every small effort counts”. The exigency of the current scenario calls for immediate action. We need to bring collective wisdom and ideas to imagine a new future. As Albert Einstein once said, “The world will not evolve past its current state of crisis by using the same level of thinking that created the situation.” The unprecedented and unmatched growth and development that we are experiencing today demands an equally radical and proactive response for biodiversity and environment. We need to draft a wide range of visionary plans, policies and practices around a new social paradigm to work ahead and save our biodiversity and valuable resources. Editor’s Note: Set to start on July 13, 2010 the International Climate Champions training programme by the British Council in India will be a week long affair and will bring together young enthusiastic climate champions from across the country and will empower them to work against the adverse impacts of climate change. Shortlisted through a nation wide selection procedure, these committed young fighters are very serious about bringing a green change. Delhi Greens congratulates one of our own, Akanksha Gulia and all the other Climate Champions for coming forward to be the change and make the difference. We wish you all the best! PrevIndia Voted as the Most Environment Friendly Nation in the world. Chance or Choice? I write from the Renewable Energy Park in Gurgaon and look forward that the students/schools you have been working with,may visit the facility. Govind knows about the place.